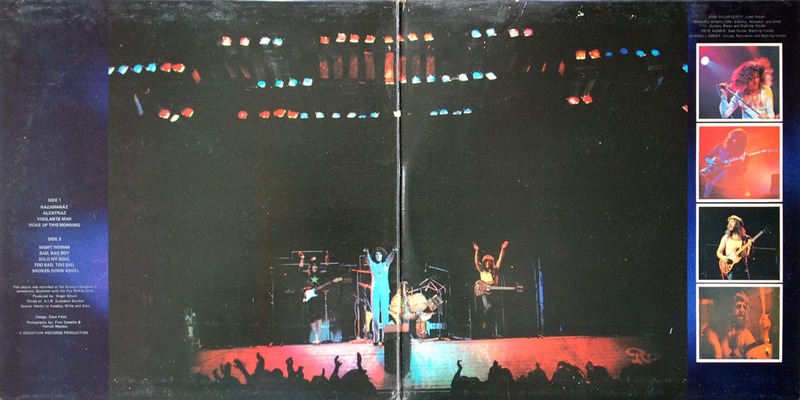 Nazareth’s 3rd LP and the first release on the newly formed Mooncrest label following the demise of Pegasus Records which had released the first two Nazareth albums (“Nazareth” and “Exercises”). Printed by EJ Day Group. B&C Records credit on rear sleeve. Original promotional sticker on front cover on my copy. “MANUFACTURED AND DISTRIBUTED BY B&C RECORDS LTD” on label. Here’s a very strange and rare copy of the label with one of the tracks missing! Thanks to Serge from Samara in Russia for spotting this one. Could this be the very first pressing label that was later corrected to include “Broken Down Angel”…? It would be more odd if this was a later pressing so my suspicions are that it was printed like this for first few copies and corrected later. 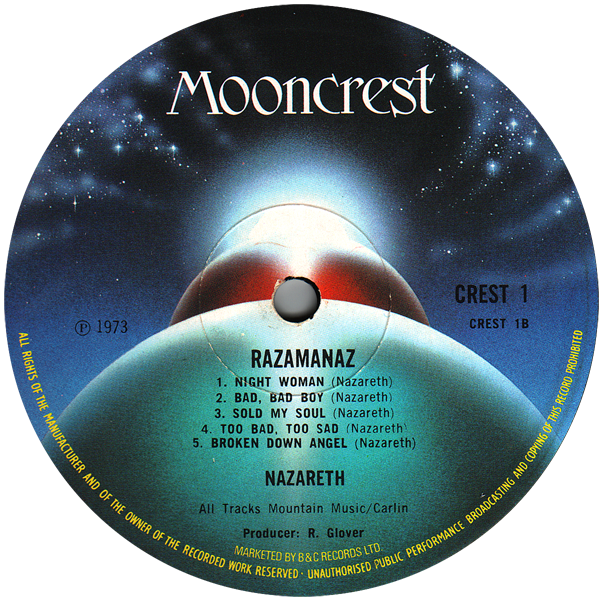 Original 1st pressings came with a light blue inner sleeve with a picture of the first 2 Mooncrest album releases (Nazareth & Lighthouse) on it. I suspect the sticker on your copy was added after the chart success of Broken Down Angel? With reference to “Broken Down Angel”, demo copies of this and MOON 2 – LIBIDO “Hold On To Your Fire” were issued in a yellow promotional sleeve proclaiming “First releases on MOONCREST” and also had a SILVER as opposed to BLACK typeface. I have also seen a stock copy of MOON 1 with the silver typeface. 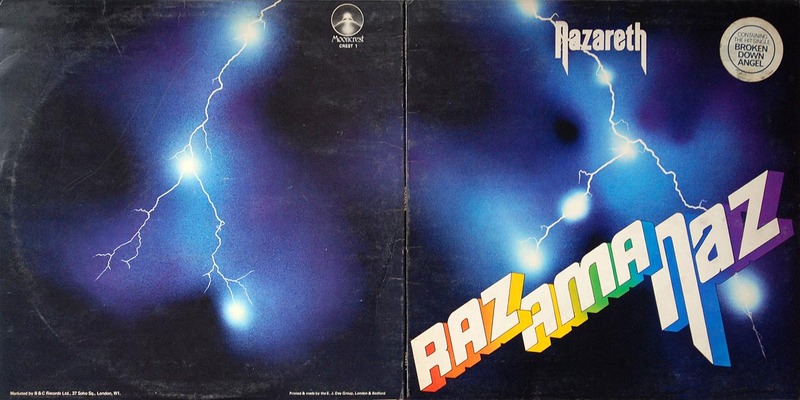 As an additional comment MOON 9 – Nazareth “Bad Bad Boy” was released in a picture sleeve & is the only picture sleeve issued by the label that I have come across. Excellent updates Mr Dawgg! Pictures to follow as soon as they arrive in my collection!